Our tracking system can be used to automate training and learning experiments. The input and output channels offer the possibility to automate experiment control. No human observer is needed any more to perform complex behavioral experiments. 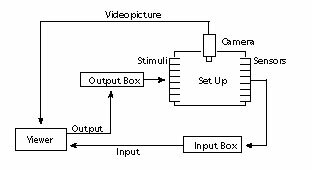 Besides the input channel for the video signal, Viewer’s basic version contains an additional analog input and output channel. During object tracking you can record additional information (for ex. sound) from the experimental arena via the input channel. The standard output channel allows you to intervene during the experiment by triggering peripheral devices via the PC’s serial ports. This can be timed automatically or can be dependent on the animal’s location – or both. The program can give out a signal (e.g. light flash) serving as a stimulus with rewarding or punishing character. A triggering event could be touching an object, entering into a predefined zone, or a behavioral pattern. As an extension we offer external boxes, which can be controlled and exploited with the help of 8 analog input and 8 digital output channels. With this possibility you can build fully automated training and learning experiments.